Where do I even begin?!? Toys have been the center of my frustration for a while now. My kids share a room. A small room. One small room and toys for 2 kids just don't mix. It started with the one red tub and just kept growing. It was totally out of control!!! Because it was such an unorganized mess the kids rarely played with their toys because they couldn't find the toy they wanted to play with. Also, in the process of looking for the toy they wanted everything was thrown onto the floor. Which was very aggravating to me. It would take them forever to clean up the mess (even more aggravating to me). There had to be a solution. Last week while they were busy watching a movie I cleaned up their room. I left out a few bigger toys for each of them. Toys that they love, but haven't played with because they couldn't find them in the toy pile. Now they are enjoying these toys that they love. I also hung up a few costumes for Dakota to wear. He loves to be Super Heroes. The rest of them are hung up in his closet. All the other toys are in two tubs (one for Dakota and one for Aiyanna) in their closet. When they start to seem bored with the toys that are out I will trade them for some "new" toys from their tubs. I think it's win-win. The room stays clean, they can actually find toys to play with, and when these toys get old they get "new" ones. Best of all I am no longer irritated about the toy mess. YAY!!!! This song is such a reminder that God is "I AM". I hope you really listen to the words of this song as you enjoy the beautifu﻿l pictures in the video! I can't believe it's Friday already! Where did this week go??? I guess that spending our days at the beach has made me lose track of time. I thought it would be fun on Fridays to show you some things I had made before I started blogging. When Dakota was about 13 months old I needed to go to work so we could make ends meet. I made him little quilt to take to "school". Each square has a pictue on it. The pictures are of Dakota, Me, and Scott. That way if he started to miss us he could look at pictures of us on his blankie. On the middle square I embroidered his name. This is the blankie he used for naptime. He had to bring it home everyday. This instantly became his favorite blanket. I have this blanket tucked away safely, but I think I might get it out for him. I think he would love to see picture of himself as a baby. I hope y'all have a wonderful weekend!!!! This topic is something I have debated writing about many times. Depression is a real thing. ﻿Not many people know this about me, but I struggle with depression. I have struggled with this for as long as I can remember. My life as a child was different than most children. I carried a BIG, BAD secret for years. It's something I still can't talk about to this day. Something I don't know if I can ever speak in words the unspeakable things that I went through. This BIG, BAD "thing" is the reason for my depression. At the age of 16, I was taken from my parents and placed in Foster Care. For the first time in forever I what it was like to have peace and security. My entire family disowned me. By the time I was 17 I was headed to my 4th foster home and 3rd High School. This is hard for anyone, but it was very hard on me. I felt like no one in the world cared about me.
. I was so depressed. I remember one day sitting at the edge of a pond contemplating living. I couldn't bare another flashback, another new school, another new home. I feared doing or saying anything, afraid I upset the Foster Parents and get moved yet again. Mostly I feared people would find out what I went through. I just couldn't take it anymore! I shut down and went into a deep depression. Depression is not something I'm proud of AT ALL! It's something I'm embarrassed about it and I feel very guilty about. I know this isn't a typical type of post for me. I felt like I needed to say it. I hope it helps someone else who reads this! If you struggle with depression, just know you are not alone!!! I am here. I can totally relate! I know kids grow fast, but Dakota doesn't have growing SPURTS. H﻿e just never stop growing. He is very tall for his age. He has been since birth! He was 3.5 weeks early and was 22.5" long. He couldn't wear newborn clothes they were to short. He came home from the hospital wearing 0-3 months clothes. At 12 months he was wearing 2t, and now he is 5 and is wearing size 6 and some 7's. He is tall and very thin which makes it more difficult to find jeans, pants, and shorts that fit him well and are comfortable. Needless to say keeping him in clothes that fit can be very costly. It seems like every time I turn around he is outgrowing everything. At the end of winter he started to outgrow his jeans. The waist fits really well, but they are all too short now. So to save some cash on summer clothes I turned them into shorts. Grab a pair of shorts that you like the length of. Measure the inseam ( the crotch to the hem). Add 1.5" to that to account for the hem. Measure from the crotch and cut off the jeans. Now you are going to prees the hem. Fold up 1/2" and then another 1" and press. Stitch the hem. Makes sure you change your needle to a jeans needle and also use jeans thread. I adjusted my stitch length to a longer stitch. And adjusted the tension to +1. To get your stitch length and tension correct I suggest the fabric you cut off as a practice piece to get your adjustments as every machine is a little different. We had a great weekend filled with playing at the beach and going to church. I have something exciting (at least to me) in the works. I am hoping to have all the information that I need put together for next Monday. It is a BIG project!!! One that I can't do alone, so I will definately need the help from y'all, my sewing friends! This week I thought it would be nice to do something for someone who you don't know real well or have recently met. A neighbor, new co-worker, someone new at church, etc. You could do anything. Buy them coffee, treat them to lunch, bake up some cookies for them, sew up something, etc. We have a new Youth Pastor at our church and I adore his sweet family. Their little girl is the same age as Aiyanna. They have quickly become friends! We were at family night at Chick-Fil-A last Tuesday and they were there as well. 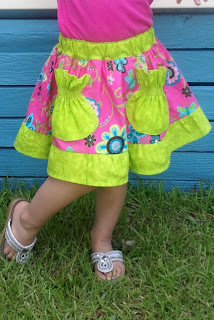 Aiyanna was sporting a new skirt I had made her. 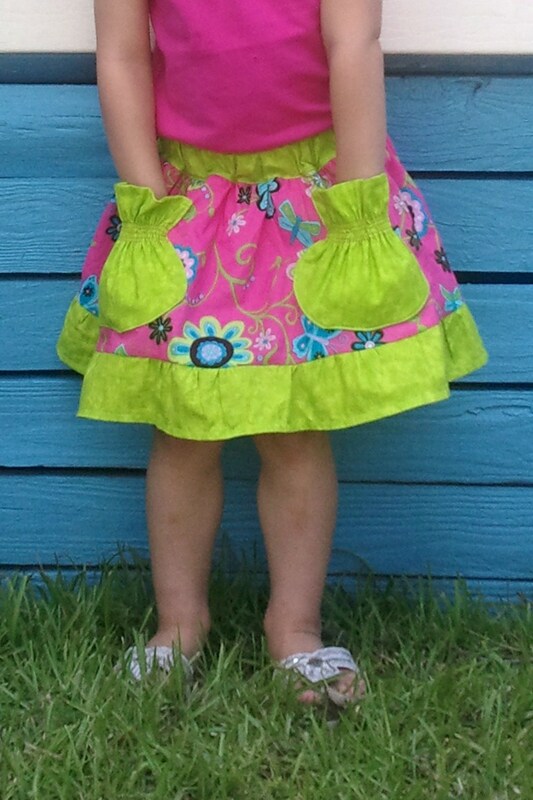 Heather, the Mom, commented more than once that she loved Aiyanna's skirt. So I am going to make a skirt for Aiyanna's new little friend. I found some super cute seersucker fabric with hearts all over it that will be perfect! And for the baby brother we are giving him a Taggie Blankie. Who are you going to do something nice for this week? I hope y'all ha﻿d a wonderful weekend. A couple of weeks ago I told you about little Annabelle. Annabelle has lived in the hospital since birth. 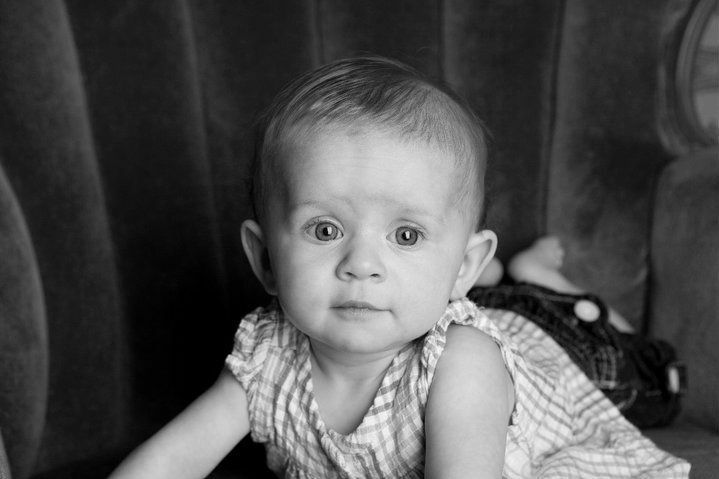 On April 9, 2011 Annabelle received a heart transplant. She is doing well and they are hoping to go home soon! As you can imagine with Mom being at the hospital with Annabelle there isn't time for shopping. Annabelle needs summer clothes. Mom thinks something that opens easilyin the front would be wonderful since she will have tons of doctors appointments. I am going to make her some summery kimono shirts and skirts. She will need 12-18 months size. I hope you will join me in making something for Annabelle. Krista (Annabelle's Mom) has sent me her address. 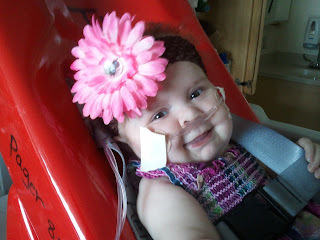 If you are making something for Annabelle please email me for the address to send it to. I hope y'all have a wonderful day!!! Hi everyone! I hope y﻿'all had a wonderful Mother's Day!!! I went out of town and spent the weekend with my wonderful in-laws. Can you believe I forgot my computer?!?! I had my lap top, phone charger, book, etc in my laptop bag. I packed up the car and left the laptop bag sitting on the floor. I didn't even realize it until I unpacked the car later that evening. I couldn't believe I did that. I don't ever leave the computer at home, but it was good thing. I spent more time talking and visiting with Momma than I would have if I had my computer with me. We had a lot of fun. One of the fun things we did was go to a Mother Daughter Tea at church. My niece and her daughter came over that morning and we made headbands to wear to the Tea. It was fun to see how each one turned out. Each girl had a different request. Funky, girly, not big, and pink. With our headbands we would have fit right in at the Royal Wedding. I wanted to give you a quick update on Lilly. I received an email yesterday from LISA that she is doing well and healing nicely!!! She is wearing the kimonos that were sent to her from all of you wonderful ladies! A while back I won a pattern from the Little Lizrd King. I chose the Apron Knot Dress. I had seen them everywhere and wanted to make one for Aiyanna. I tweaked it some. I added a ruffle to the bottom instead of the band. Also I made the apron a little different. 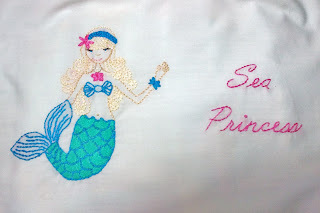 Here is a close up of the apron. 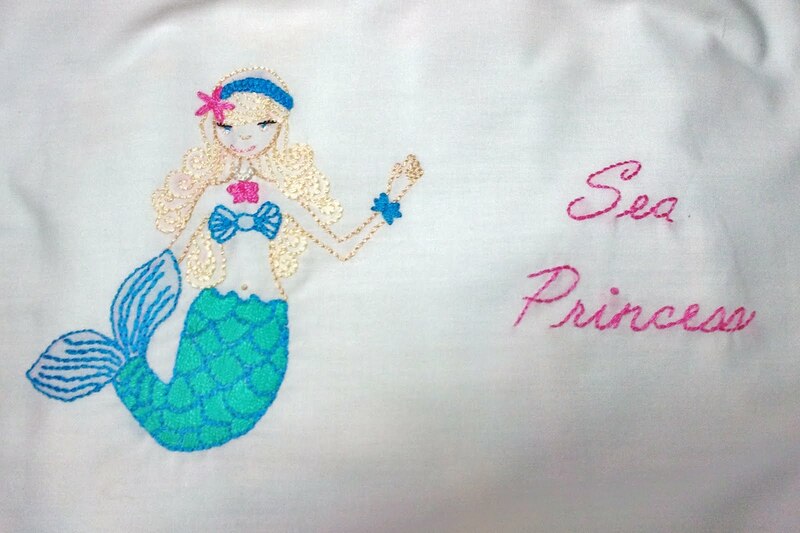 I hand embroidered the meramid and "Sea Princess". It had been a long time since I had done hand work. I really enjoyed and plan to start doing more of it. 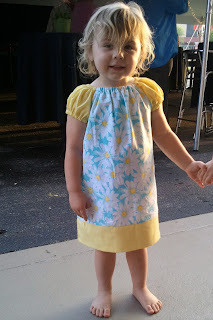 We received so many compliments on this dress when she wore it the other day. 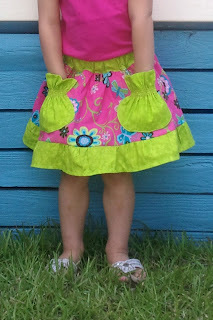 This dress is now available for purchase in the SHOP! This i﻿s a song that our band sings a lot at church. And another one of my favorites.